The Synod of the Church of Ireland was held in a hotel near St Patrick's Cathedral in Armagh, Northern Ireland. As most of the guests were also staying in the hotel, it was possible to meet from morning to night. The opening service in the cathedral was led by the Archbishop of Armagh and Primate of All Ireland, Richard Clarke. An ad hoc choir took care of choral music and the congregation did its best to raise the roof with their singing. As I was still not attuned to the Irish English, my understanding of the sermon was incomplete, but it was clear that its undoubtedly serious message was interspersed from time to time with a joke, much to the congregation’s delight. The bishops did not wear mitres; the Eucharistic Prayer and communion were celebrated much as in our own churches. On the way back to the hotel, I met our good friend, Bishop Michael Burrows, who had already spotted me during the church service. On the way north, he had observed that the border, once virtually abolished, had now been reinstated, due to Brexit. Sadly, this also threatens to revive the old tensions that had become a thing of the past thanks to European integration. 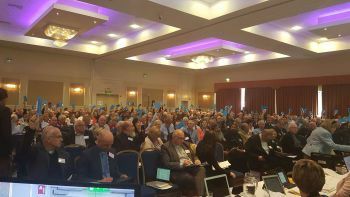 The members of synod were led through the agenda under the alternating, strict but humorous, direction of one of the two archbishops, the above-mentioned Archbishop of Armagh and the Archbishop of Dublin, Michael Jackson. The morning session was opened with a short service of prayer in the hall. As with our synods, there was some tension between the more formal discussion of the necessary business items and the exchanges of experiences, thoughts and opinions. The Commentary on the Constitution was presented as one of the first items on the agenda. This was followed by elections in several of the commissions, though I noticed that there was little to vote on (perhaps that had been done in advance) and that the candidates were elected by acclaim. The Constitution was compared to the lead used in an old stained-glass window, of itself somewhat colourless and dull, but which is necessary to hold together the pieces of coloured glass – meaning the members of the church. For me as an outsider, things were more interesting when the discussions became more specific. I will give two examples: the first dealt with an alternative order for Morning and Evening Prayer for use on Sundays, the second with a reduction in the number of synod members. The first motion, I understood as follows: an alternative order of service was being offered to replace the Eucharist. In this respect, I was heartened by the candid reactions that could just as well have come from Old Catholics steeped in liturgy. Why something new? Did the existing services not offer enough variety? How could a common Anglican identity be retained if Common Prayer were no longer used? Once the discussion leader had restated the reason for the request, namely that the present form was no longer satisfactory; that the request for a revision had come from the bishops; and even that Common Prayer is not a static whole, but work in progress, only then could a vote finally be taken – no easy task with some 400 synod members present. The motion received the required 2/3 majority in both the house of clergy and house of the laity (the bishops still form their own ‘house’, but either do not vote, or vote together with the clergy) and could thus go to the next round. There were several further amendments to be made to the text of the motion. The second proposal concerned a possible reduction in the number of synod members. The current practice is that each diocese has a fixed number of representatives on the synod, giving a total of 608 synod members. This is all very good and democratic, but it is very expensive and for some people it is simply not workable, for example, someone running a farm cannot easily take three days leave of absence. The proposal was therefore to have the number of synod members weighted according to the number of parishes in a diocese. 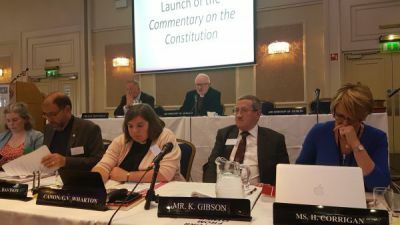 The disadvantage of this system is that the vast majority of synod members would then come from the urban areas of Dublin and Northern Ireland, leaving the rural areas in the rest of the island feeling poorly represented. In short, it is necessary to find a new balance that would take into account both the representative nature of the Synod and its efficiency (and costs). Here, too, there was a vote for a further revision of the proposal. The House of Bishops’ Declaration on the Human Sexuality was noted without further comment – it had apparently already been presented earlier. It stated that the bishops did not want to change the status of marriage: Marriage was to remain solely between a man and a woman. Prayer may be offered for other relationships, but this must be in keeping with the teachings of the church and such relationships are not to be blessed. The specific inclusion of ecumenical guests, who were also allowed to speak (3 minutes). We received greetings from the Copts, Presbyterians, Methodists and the Scottish Episcopal Church. 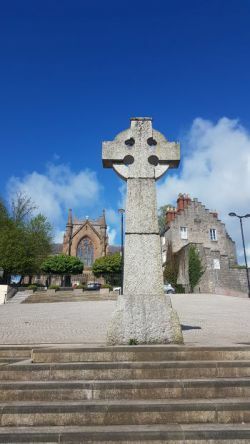 The Roman Catholic Archbishop of Armagh, together with his Anglican colleague, Eamon Martin, launched the call to prayer begun by the Archbishop of Canterbury Justin Welby to pray in the ten days between Ascension and Pentecost that people would come to know Jesus. I greeted the synod on behalf of our International Bishop’s Conference, emphasizing our joint mission in Europe, which dates back to Willibrord, and thanking them for their hospitality. The corridors were filled with talk of the forthcoming Irish referendum to overturn the ban on abortions. The archbishops had to defend themselves against comments on a statement they had made somewhere in the press on this subject. They had not issued this statement "in the name" of the Church of Ireland but had spoken "to" the Church of Ireland. A lady, who had apparently set up a Pro Life stand without permission, grabbed the microphone to proclaim her views, and was gently shown the door. The financial situation did not seem to be too worrying, but when you start to dig around in Ireland, you soon find something old that will instantly cost a lot of money. Investments are made as environmentally friendly and as responsibly as possible. Cooperation with the Government and third parties is sought for the maintenance of historic monuments. A lot of work is done by committees: refugees, education, university pastoral care (eye-catching presentation), liturgy, marriage counseling, etc. In conclusion: It was a privilege to be able to spend three days together in prayer and in conversation. The Irish have a great sense of humor which they do not hide under a bushel - especially when it comes to bishops. The atmosphere during the synod enabled everyone to have a voice, occasionally to give a somewhat evangelical (but not exaggerated) testimony of their faith, and to take each other seriously, even when someone had clearly misunderstood an issue. I can imagine that the, sometimes fierce, emotions with which the synod members expressed their views could easily lead to disagreeable clashes. Dissatisfaction with the English Brexit has caused the Irish to turn in a more easterly direction, looking beyond ‘big sister’, to continental Europe.